Every one of these transactions was recorded as a chattel deed in Tippah County — a concept The Legal Genealogist has talked about before here4 — and every single chattel deed including these contained the exact same preprinted language: “That in consideration of the sum of One Dollar cash in hand paid” to the person putting up the collateral, the items were to secure the loan. Why that language? What’s it doing there? In a land deal, the seller gives up his land and gets the money paid by the buyer, while the buyer gives up his money and gets the land from the seller. In these chattel deeds, the lender was giving up money or goods or supplies in return for a promise to be paid money or to have specific items only in the case that the money wasn’t paid. The borrower was giving a promise to pay money or give up the specific items pledged, and getting the money or goods or supplies. Again, the recital of the one dollar doesn’t mean a thing in terms of the real value of the transaction. 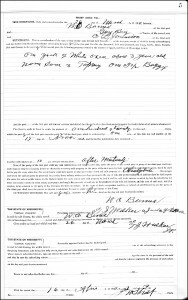 It was simply the shorthand way that the lawyers writing the documents — and those printing the forms for those 1910 chattel deeds — made sure that the documents would be interpreted by a court to have consideration and so would be binding on both sides. Thanks Judy! I have often wondered why one dollar is used so often in contracts. It’s interesting how the sum of one dollar can take on a much deeper meaning. You may be right, Ray, but there are at least two other possibilities about your Hausers: (1) the law in that jurisdiction might have required that every child or every son be included in a will, and the dollar was to abide by the law even though the one son had already received what would have been his share under the will; or (2) no matter how much the ancestor loved his sons, William may moved on and even his whereabouts might not have been known. Yet the father could have felt that he had to mention William. Hey Judy! Thanks so much for the response! Please allow me to clarify this, as the additional details further illustrate the impact of “one dollar” in a will. “First. I direct all my just debts and funeral expenses to be fully paid and satisfied as soon as conveniently may be after my death. Second. I give, devise and bequeath to my son, Heinrich Hauser, his heirs and assignments forever all my property, be the same real, personal or mixed of what nature or kind soever and wheresoever the same may be found at the time of my death. Third. I give and bequeath to my son, Wilhelm Hauser, the sum of one dollar. Fourth. I give and bequeath to my son, George Ludwig Hauser, the sum of five dollars. Fifth. I give and bequeath to my daughter, Elizabeth, wife of Charles Harlander and Josephine, wife of Thomas McKee, each the sum of five dollars. The Hauser family is interesting. Pius Hauser was born (and baptized Catholic) in Empfingen, which was part of the small province of Hohenzollern-Sigmaringen at the time of his birth. Sometime after 1849 (when Empfingen became part of Prussia), Pius Hauser came to the U.S. and settled in Allegheny City (now the North Side of Pittsburgh). Interestingly, all five of his children remained in Allegheny City through 1900. Henry and Louis married sisters from the same family, and William had an address on the same street where he was born and raised in Allegheny all the way through his death in 1928. One possible source of his father’s dislike could be the fact that following the death of his first wife, William remarried in 1892 to Jemima Baker, who – curiously – was born in England. Perhaps Pius Hauser did not get along with his new daughter-in-law. It could have been religious differences, although this seems less likely given the fact that his favored son Henry Hauser joined a Christian (Protestant) Church. Interestingly though, William Hauser began using the surname Houser beginning in the 1900 Census. His son, Norbert Houser, married my great aunt. So – bringing it back on point (finally), the “one dollar” in the will sure seems to have had a big impact…. That looks a lot less like the father not liking the son William and much more like the father having some reason for favoring one out of several children, Ray. I’m always a little suspicious when the beneficiary turns out to be the executor, so that raises some questions in my mind, but the big question is this: if all the children continued to live in the same area, did any of the others challenge the will? If not, then you may find that it’s much more likely that they all understood why the one son was getting everything in the will and agreed with it. Good idea about checking further on the estate Judy! 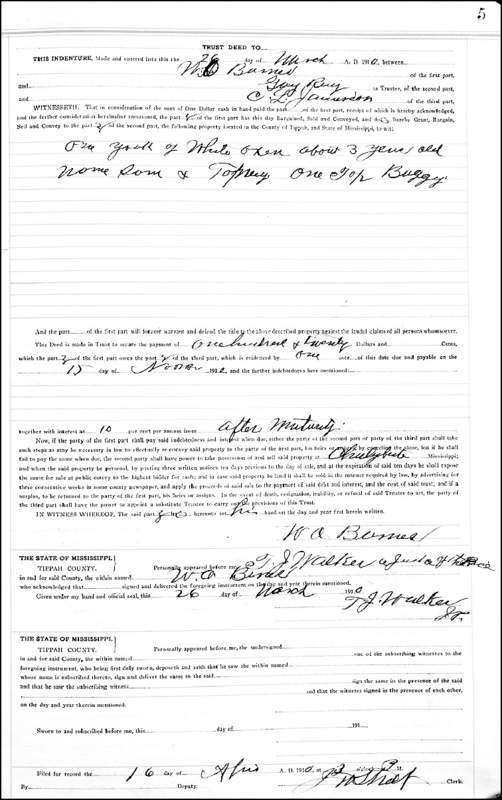 This will is from Allegheny County, Pennsylvania – which are now online on Familysearch. Unfortunately, the letters of administration are only available at the City-County building in downtown Pittsburgh. As such, I haven’t had the chance to get down there to look at the letters. But – as you have advised, this is definitely worth a further look, as something seems to have been going on with the variable dollar amounts for the children and the elevated status of Henry. What if each party promises something in consideration of a nominal $ amount, but when each party pays the other the same amount. Doesn’t it defeat the purpose of the “consideration” and requires the law to accept the sham when the equal amounts paid by each party to each other create a Net $0 situation? The law is absolutely chock full of these sorts of things, where it overlooks the reality in favor of the form.